Know where all your workers are and what they are working on right now? Know how much time your workers are spending on an individual project? Find it too time consuming to track your workers’ attendance, hours spent on projects and their costing? The Marine, Oil & Gas and Construction industries are all about the workforce. Managing their workforce extremely closely is a top priority. Tracking the attendance of the workers on a daily basis, often on multiple shifts and flexible hours, is a complicated and time-consuming task. As a consequence, the computation of salaries and project costing becomes tedious, delayed and often inaccurate. 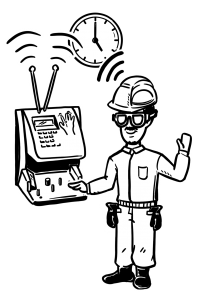 astorTime™ is an innovative solution that makes tracking your workers’ attendance and calculating project labor costs a breeze. Equipped with a comprehensive and flexible policy engine, generating payslips is just a click away. Combined with our SafeSmart RFID tracking technology or biometric systems, astorTime™ provides a holistic solution to keep track of your workforce. Productivity of Marine Industry is dependent on the productivity of contractors as they constitute 90% of the workforce deployed in the industry. Tracking and managing workers effectively in a timely fashion is the most basic necessity for improving shipyard productivity and that of its contractors. The Marine industry in general and contractors in particular have the lowest IT penetration due to several factors in which cost, ease of use and proper training play a crucial role. Empowers shipyard’s and subcontractors’ management with the insights to make necessary executive decisions. Provides visibility, transparency & accountability. Facilitates co-sharing model of infrastructure amongst the shipyard and its contractors. Does not require capital expenditure of IT systems and infrastructure by leveraging on latest on-demand Microsoft Technologies and Azure platform. An innovative solution specifically developed for the Scaffolding Trade that makes tracking operations, calculating project costs and computing employee salaries a breeze. Equipped with a comprehensive and flexible scaffolding policy engine, generating pay-slips and invoices is just a click away. Extending astorTime™ functionalities for all industries looking for time management and job accounting on the go without any infrastructure requirements, astorTime™ Fingerprint gives you an innovative device complete with an intuitive software that allows you to efficiently manage job allocation, employee attendance and job report submission at real-time basis by using Astoria’s popular Cloud Computing system. Empower yourselves with astorTimeTM innovative fingerprint device with GPS enabled location tracking.